I expect more from a comeback movie. After The Chronicles of Riddick, it seemed the character was going to remain a good idea that never got itself together. Riddick (the movie) is a self-described ‘back to basics’ for the series. Offering long-time fans little new to see and new comers no reason to like this generic action hero. The trailers would have you believe this is all just a retread of Pitch Black. Where Riddick gets caught by mercs but then scary monsters come out at night to kill everything. That’s only true for the third act of the movie. The first two are disappointing for different reasons, though. I won’t spoil those acts but suffice to say, there’s good reason they weren’t featured much in the trailer. In general, Riddick is too overindulgent. There is zero sense of urgency to the action or characters. Riddick is going to take his damn time finding his animal side. The bounty hunters know Riddick has to come to them so set up camp and wait. And even minor events or details are fully played out as though they were critical the plot. Yet weirdly, this doesn’t extend to the fighting, which is short and unimpressive. 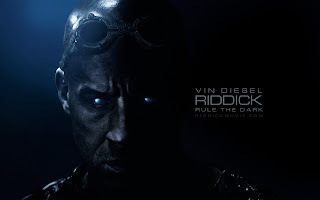 Riddick built his reputation on flashy, cool, stunts. He’s given few moments here to really show off. I’ve always appreciated the Riddick’s series sense of ‘show don’t tell’ style. The major workings of the universe have been left unexplained or unknown, yet clues and bits of conversation drop regularly enough to give a functional understanding. The problem with this new Riddick is not recognizing many of its core elements aren’t unique or fleshed out enough to hold interest. A rag tag bunch of mercenaries can’t support an entire second act because everybody has seen these same guys before. Ditto the snarling aliens. There just isn’t enough new insight into the universe or character. And overall, this storyline is a needless detour. Recycled plot points and an unconvincing notion that Riddick got soft can’t justify another hour and a half on another lifeless, desert planet.